Delta is taking additional delivery of its brand spanking new Airbus A220 planes — and they’re headed west. Starting in late 2019, Delta’s hubs in Seattle, Los Angeles, Salt Lake City, and Minneapolis will get the best narrowbody plane flying in the US. The A220 is a customer-friendly aircraft. 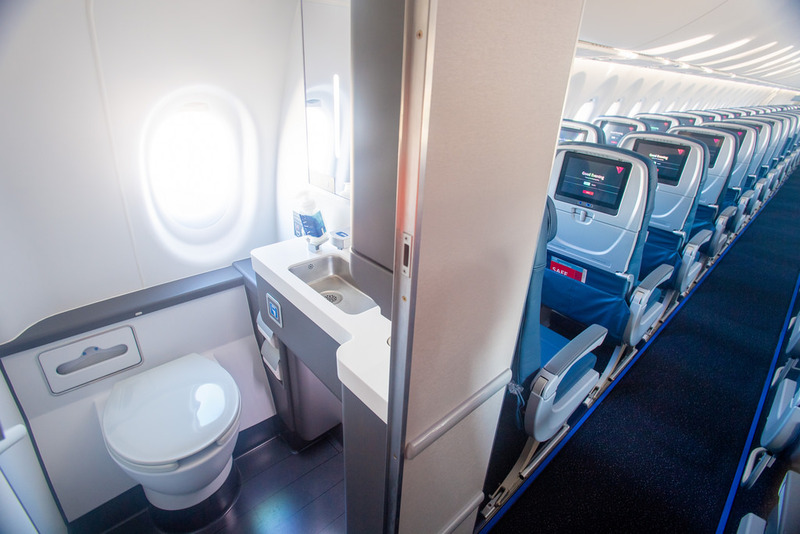 We’re talking gate-to-gate Wi-Fi, some of the widest economy seats around, and even a window in the spacious lavatory. Nope, no contorting to use the bathroom here. Delta’s version of the A220 has a total of 109 seats, including 12 first class seats, 15 Comfort+ seats, and 82 economy seats. It features seatback entertainment at every seat and high-speed Gogo 2Ku Wi-Fi. Seats in economy are an impressive 18.6″ wide, making them the widest economy seats of any narrowbody. Delta is putting the A220s on competitive business routes that flow through the hubs of other airlines. These flights are now bookable so if you wanted the chance to try the new bird, get going. Thanks for the catch — fixed! This is a fantastic aircraft! I was on one of them earlier this year operated by SWISS. Love the huge windows and overhead bins. The bathroom was roomy too. Delta is smiling ear to ear knowing they didn’t order B737’s!